Launch Control is a robust, compact and portable control panel with 16 assignable knobs and eight pads that's ideal for hands-on control of mixers, instruments and effects. Perfectly designed to partner with the Novation Launchpad, Launch Control works with all major music software - and with the iPad. Launch Control's three colour pads can be used to fire off samples and scenes, while the knobs can tweak filters, change levels, adjust panning, effects sends and more. In addition to its stand-alone capability as a compact control surface, Launch Control is the perfect partner for Novation's Launchpad, the controller that changed the face of modern music performance with its grid of 64 three colored pads. To Launchpad, Launch Control adds 16 knobs, enabling you to transform performances and studio workflow - and another eight three colour buttons. With Ableton Live and other software packages, Launch Control delivers hands-on control of devices for a wide range of real-time performance enhancements. With the iPad, Launch Control can be used out of the box with the Launchpad app to trigger samples and effects. Launch Control connects direct to the iPad with the Apple Camera Connecting Kit (not included) and is entirely bus powered, avoiding a mains power supply. The Launchpad app allows control of samples with Launch Control's pads, while using the knobs to tweak filters and change levels to provide a compact and impressive portable performance system. 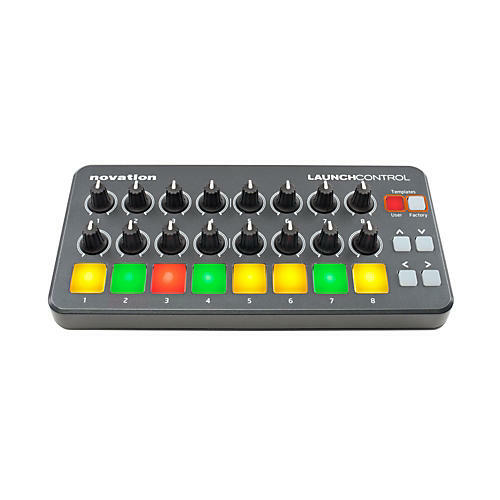 Launch Control's 16 knobs and eight launch pads can be set up with templates that let you change them to control different software parameters. There are eight factory templates and eight of your own to create and play, whatever your choice of software, giving an effective arsenal of up to 448 controls.